Tate Kuerbis was head designer of the Air Jordan 18. Tate was a part of Nike since 1995 and Jordan Brand since 1999. So designing shoes was nothing new to Tate. 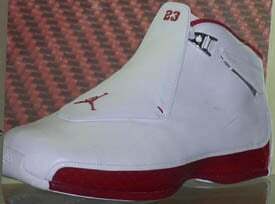 Inspirations can be seen from different places on the Air Jordan XVIII, for example the “rubber heel wrap” idea came from race car driving shoes, the Carbon fiber-based monocoque (F1 race cars), and the bold stitching came from Italian dress shoes, but the overall outlook was from the automobile world (one of Michael’s adorations). The Air Jordan 18 did not come with a fancy carrying case, or CD (which many of us enjoyed), but they did come with a nice slide out box, towel, brush, and an “Air Jordan XVIII Driver’s Manual” pamphlet. hidden quick lace system, suede leather uppers and zoom air sole. Since the uppers were made out of suede, they did attract a lot of dust, dirt marks and scuffs. Also the soles and mid sole were made of rubber, and just like the Air Jordan V they collect dust, which can make someone slip and fall. If you played in an indoor gym, you were OK.
On the Air Jordan XVI and XVII, Jordan Brand would use the “+” for a modified model. The Air Jordan XVIII used a XVIII.5 or 18.5, which ever way you wanted to write them. Pretty much nothing changed except the removal of the cover, and the jumpman was now on the side of the shoe, also the date 1985-2003 was put on. 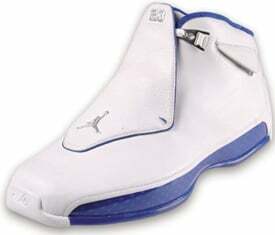 In 2003 when the Air Jordan 18 released, three models released, and retail for them was $175.00. 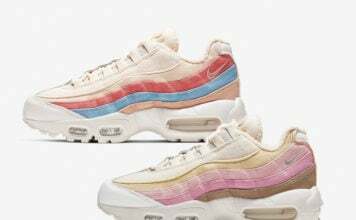 Two low models released with a retail of $150.00. 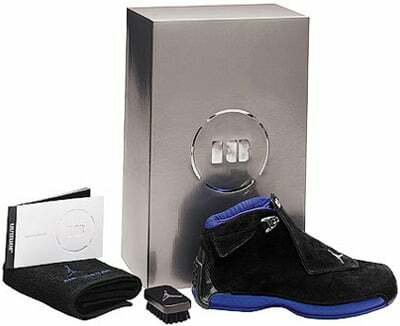 Later in 2003 the Air Jordan XVIII.5 released in two color ways and retail was set at $175.00.